Rangoli is a traditional decorative folk art of India.Rangoli, one of the most beautiful art forms of India, is comprised of two words, 'rang' meaning 'colour' and 'aavalli' meaning coloured creepers' or 'row of colours’. Rangoli is a Sanskrit word which means “a creative expression of art through the use of colour”. Rangoli basically comprises of the art of making designs or patterns on the walls or the floor of the house, using finely ground white powder along with different colours. Apart from the visual and aesthetic appeal there is a religious significance too for this ancient Hindu floor art. It is a form of a Yantra that is meant to welcome positive energy into the house and also to welcome guests. There are a number of legends associated with the origin of the Rangoli art in India. The earliest mention in regard to this art form is found in Chitralakshana, the earliest Indian treatise on painting. It is believed that the death of a high priest's son in a particular kingdom led to widespread despair. The people of that particular kingdom prayed to Lord Brahma, asking Him to bring the boy back to life. Moved by their prayers, Lord Brahma asked the king to paint a portrait of the boy on the floor. Thereafter, He breathed life into the portrait and the boy became alive again. This is the most widely believed story on how the first Rangoli got made. Another legend has it that one day, God, in one of His artistic spells, extracted juice from a mango from a mango tree to be used as paint. He then used it to paint the figure of a beautiful woman. It is said that the painting of the woman was so magnificent that it put the heavenly maidens to shame. 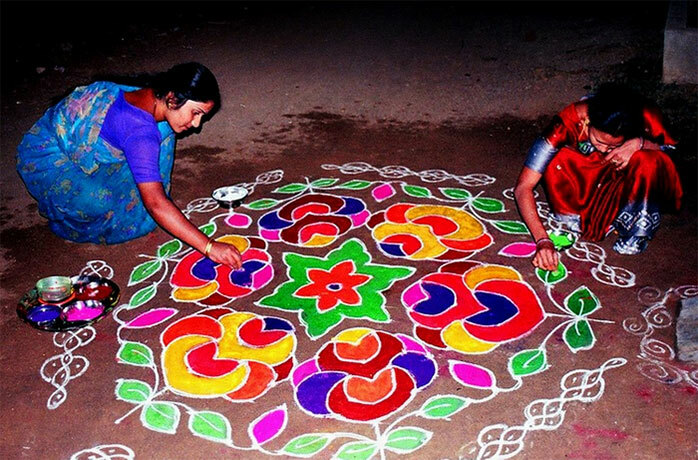 Thereafter, Rangoli became a popular form of expression with women. Even Chola rulers have been known to make extensive use of Rangoli as floor paintings in their palaces. It is also believed that since powder or sand is used for making Rangolis, (like the Hindu and the Buddhist mandalas) it creates a fragile art form that can be washed off easily and is a metaphor that gently reminds humanity of the impermanence of life and maya or the illusion that life is. 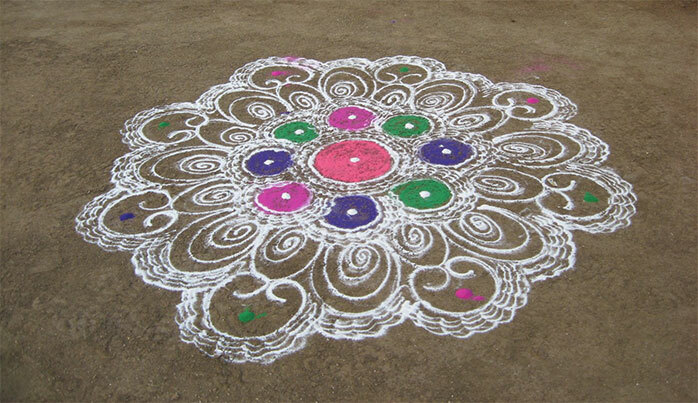 The Rangoli tradition dates back to the Indus Valley Civilisation. In Mahabharata, the gopis or milkmaids drew rangolis to forget the pain that they experienced when their beloved Krishna was away. At a much later date rangoli – drawing was listed as one of the 64 forms of art in Vatsyayana’s Kamasutra. It is said that Gautam Buddha himself was an expert in this art. In a typical traditional household, the lady of the house starts her daily household tasks by first cleaning the main entrance of the home and decorating it with rangolis and then the pooja room. Her regular routine begins after this ritual which infuses in her a good feeling as well as a sense of cleanliness in the household. These decorative designs are made in the courtyards of homes during Hindu festivals, walls, pooja rooms or mandirs, entrance to rooms, main entrance or threshold of a home, places where food is served and are meant to make these places sacred for welcoming and pleasing the Gods. The practice of decorating various parts of the home with these auspicious symbols reaches a high especially during major festivals like Diwali, Pongal or Sankranthi, celebratratory family events like a marriage, thread ceremony, or other religious events. The Rangolis portrayed at these times are much more elaborate than the regular ones and are created to appease the Gods and bring in good luck. 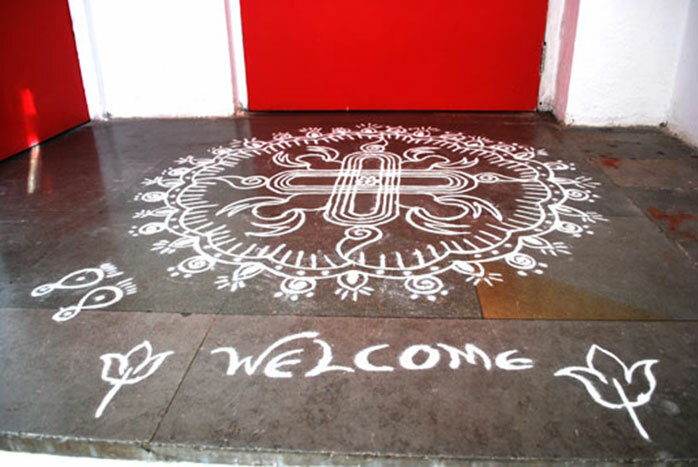 A rangoli drawn at threshold of a home.